City of Bones (The Mortal Instruments, book 1) by Cassandra Clare. All the stories are true. Once Clary begins to see the streets of New York with the Sight, the world will never be the same again. 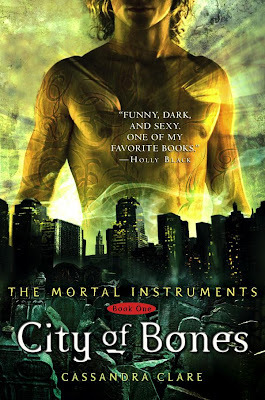 City of Bones is a fabulous beginning to The Mortal Instruments urban fantasy series. An action packed, character driven novel of friendship, love, loyalty, and betrayal and the consequences of knowing the truth. Filled with fabulous paranormal creatures, endearing characters, hot romance and unexpected twists that will leaving you gasping for more. This is a must read for urban fantasy and paranormal romance fans! I recommend City of Bones (The Mortal Instruments, book 1) to readers of paranormal romance, fantasy, science fiction, young adult, and especially to fans of urban fantasy. City of Bones on Amazon . City of Bones on Goodreads. I love this book! Great review!!! I love this series with a fierce passion!! I couldn't put this book and any from the series down. I want Clockwork Angel, yesterday! I'm just amazed I waited so long to read this. I was captivated from the very first page and couldn't put this book down. This is a fantastic series! I ordered the rest of the series for my birthday (o.k., admittedly I bought a LOT of books for my birthday, LOL!) and can't wait for Clockwork Angel. I Loved! Mortal Instuments, Great review! I've not read this yet, but I feel I need to! Thanks for the review. Thanks for stopping by & following my blog! Happy Friday! I've heard several good reviews of this book. I absolutely adore this series. Can't wait for Clockwork Angel! Thanks for stopping by my blog. I haven't read this book yet, but I have heard great things about it. I am now following! Hopping by from the book hop! Thanks for stopping by Book Ge3k. I loved this book too although it hasn't made me want to read the second in the series :) Thank you for stopping by my blog on the BLOG HOP - I am following too. I love the mortal instrument series! I have yet to read the series but the sheer response by everyone encourages me to do so. Or at least try a book. Fun review! I read this last year and loved it. I still need to read the rest of the series. I think I may re-read this one so I won't get lost with the other books. Oh, this one sounds good...I'll have to buy it. Thanks for the great review!